It's back to school time around here and I'm having a bear of a time trying to get back into the swing of things. There's only a 30 minute difference between summer break and school wake up time but it feels way harsh. I haven't added "lay clothes out in the morning" to my bedtime routine so I'm scrambling around for decent clothes in the am and then again in the afternoon. I haven't found my rhythm. 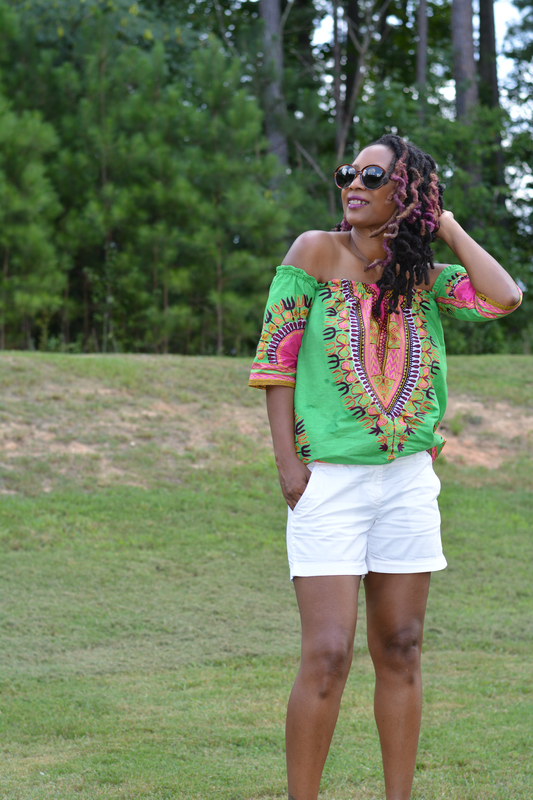 I feel good about today's post workout wardrobe change to dashiki top and white shorts. You can't go wrong with african prints. Colorful prints make it easy to match. 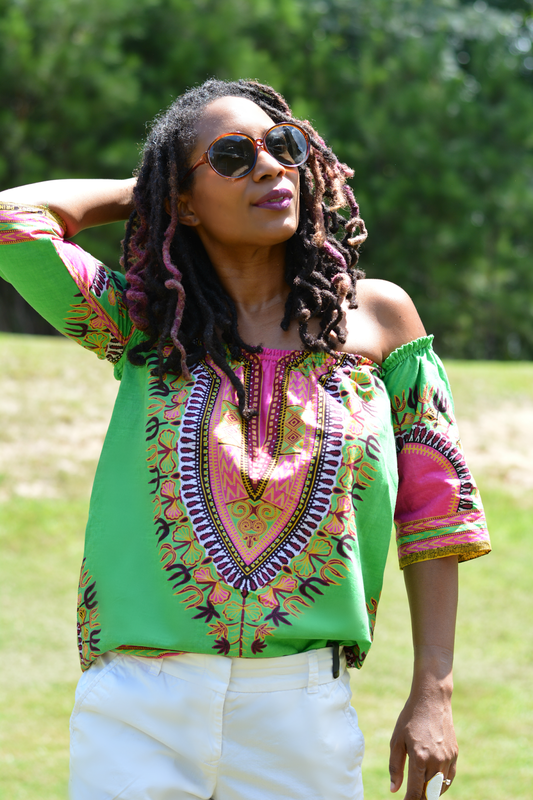 Pick something in the closet that is the same as a color in the print and you're good to go. 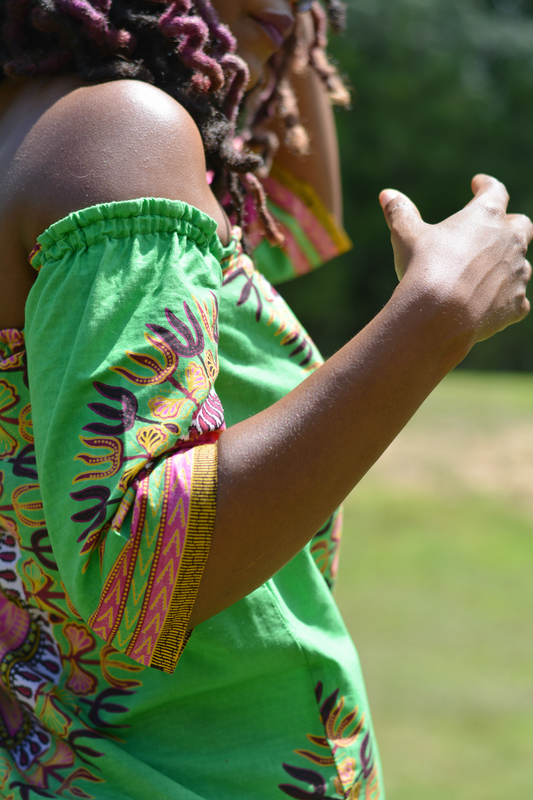 I finally achieved the vision I had in mind when I made the off the shoulder dashiki tunic. I wanted simple white shorts to wear with it and had to hit up the thrift to find a pair because white clothes are my nemesis. The stains find me. I try to stay away or buy it cheaply. I love the shorts I found because they are loose and comfortable yet they aren't the classic mom "long" shorts. The length is perfectly respectable and age appropriate (if you're into that kind of thing) while still showing off the gams. I adore my pink mules. They're my new party shoe but also can be worn to the grocery store. They have a nice chunky heel that allows me to be stylish and comfortable. I can walk all day in them. I can even dance like no one's watching which is what I did at BlogHer in L.A. which seems like ages ago when it's only been ten days. Now it's back to school and schedules and I have a first grader.